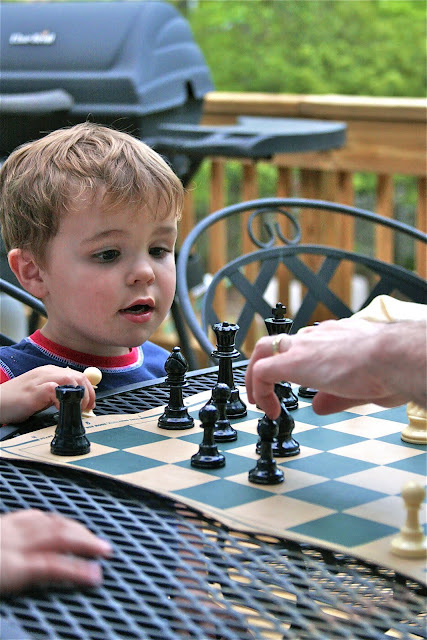 The big boys have long enjoyed playing chess with Grayson, although they are currently playing at about my level (novice), while Grayson is more of an expert. Recently Jake expressed an interest in playing, so after supper a couple of weeks ago, Grayson set up the board on the deck. Jake started out just learning how to move the pieces (which is about as much as I know), and his brothers were VERY interested in giving him lots of "useful" tips. Jake listened very closely to everything Grayson said and gave a lot of thought to each move. Meanwhile, I wanted to sop him up with a biscuit. Unbelievable amounts of cuteness were pouring out of him. He liked taking his opponent's pieces a LOT. When he was successful, great joy and wonder were evident! The coach was very serious about his coaching job. The game went on much longer than I thought ... I didn't think Jakey would last more than three or four minutes, but he hung in there for at least 10. It helped that his brothers were cheering him on the whole time. I can't remember now if it was Grayson or Jake who yelled "Checkmate!" But whomever it was, Jakey was happy. He felt like he'd won, just for playing. 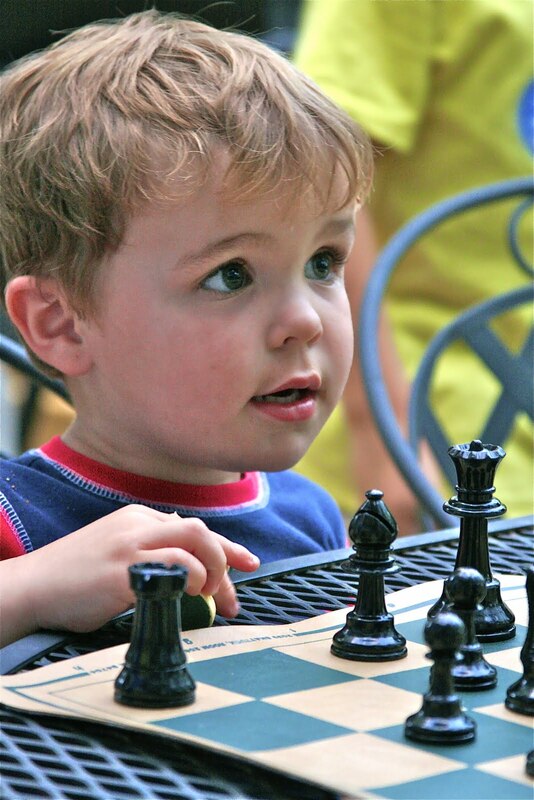 So although to me, Chess is about as boring as Trivial Pursuit (and I am equally good at both of them), I'm willing to watch as long as this little guy is playing. Mercy, your sons are so cute! Don't you just love how proud the youngest is to do whatever the "big kids" do? Oh, hand me a biscuit, too. Sopping up all that cuteness. Love the post and pictures. Praying that all of you are safe and that the storm did not effect you. Hope your nausea is much better. Good heavens. Pictures of your boys make my ovaries twitch. Uhmahguh. The look on his face in the 2nd picture.